There's a 27-year difference in life expectancy among people living in different parts of the D.C. area, according to a study evaluating census data. Here's what the study found. 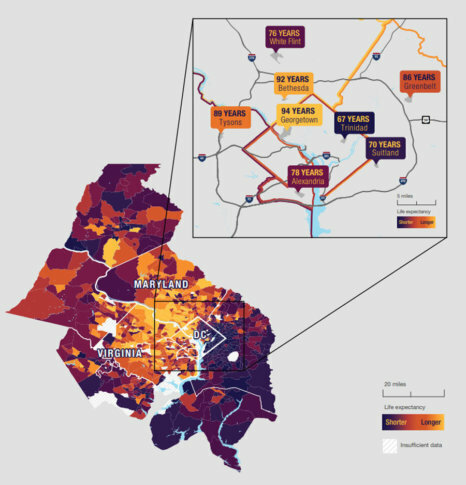 WASHINGTON — There’s a 27-year difference in life expectancy among people living in different parts of the D.C. area, according to a study evaluating census data. Local leaders, however, believe smart policy decisions can help close the gap. The study, “Uneven Opportunities: How Conditions for Wellness Vary Across the Metropolitan Washington Region,” was produced by the Virginia Commonwealth University Center on Society and Health for the Metropolitan Washington Council of Governments Health Officials Committee. The most dramatic life expectancy difference detected by the study is the 94-year life expectancy in the Northwest D.C. neighborhood in Georgetown versus the 67-year life expectancy in Anacostia in Southeast D.C. The study also finds people’s health can differ drastically within a single county or neighborhood. “All communities have these disparities,” said Arlington County Public Health Director Reuben Varghese. Policy decisions can shape myriad factors that influence a person’s health, such as education, housing and household resources, including access to food, public safety, transportation and land use, Varghese said. “Are communities walkable? That’s a land use policy,” Varghese said. He added that making sure people have equal access to resources is key to effective change. Another example of resources that might not be equally accessible to everyone is education. Someone might live in a great school district, but their child’s ability to study or learn well can be limited if that child is hungry. “Hunger and education contribute to health, short term and long term,” Varghese said. The study was presented Friday to the Council of Governments’ Region Forward Coalition; its members will take the results back to localities to help shape decisions made by governments, nonprofits and businesses. Varghese believes everyone working together can help produce change. “We are a caring region, and we need to build on that caring capacity and keep asking, ‘How do we improve the lot for everyone? '” he said.